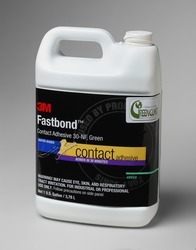 3M™ Fastbond™ Contact Adhesive 30NF is a water-dispersed high strength contact adhesive. 3M adhesives are available as liquids, pastes, tapes, films, and shaped solids. Each has characteristics to be considered for application effectiveness and efficiency.